On this website we hardly never speak about referees, but sometimes we have to. Here in Holland the whole week the newspapers still are full of referee Braamhaar who refused to give visitors Ajax a clear penalty and a few minutes later gave hometeam Feyenoord a very dubious penalty in the battle of Holland last Sunday. Last Wednesday Genoa was lucky when referee Brighi annulated a regular goal of Panucci and yesterday referee Rosetti (the best in Italy they say ?) let Gilardino score the only goal while he was in off-side position. He also refused to give Milito a penalty in the 93rd minute. The explanation of all of these moments is very easy: the referee always helped the hometeam with the very passioned fans. We can now easily prove that the public can help you to win points. Mr. Gasperini gave Biava, Juric, Modesto, Sculli and Milito rest yesterday and started with Sokratis, Bocchetti, Vanden Borre, Olivera and Palladino in the line-up. Unless the 5 substitutions the team played a good match and was unlucky that goalkeeper Frey of Fiorentina had an incredible good reaction on a shot of Milito in the 2nd half and referee Rosetti did not whistle when Gilardino scored in off-side position in the 60th minute. Mr. Gasperini did it again ! After the selection of Marco Borriello last year in the Italian national-team now his substitute Diego Milito is selected to play again in the Argentinian national-team. The Southamerican team plays at Saturday 11th October in Montevideo against Uruguay and Wednesday 15th October in Santiago against Chili. Our 29 years old central forward (who already joined Genoa from January 2004 till August 2005) played already 14 matches and scored 4 goals in the Argentinian team. Genoa bought Milito at (or just after) the last minute of the transfer-period. The door of the office of the Italian Football Association was already closed at the moment the signed contract arrived by fax, but Genoa’s technical director Fabrizio Preziosi waited for the contract inside the office of the Football Association while the manager of Milito: Federico Pastorello through the contract over the wall towards him. Genoa gets the support by over 2.000 redblue fans tonight in Stadio Artemio Franchi. Last year Genoa played a fantastic first season in Serie A after 12 years in B and C-1, only a victory against at least one of the 4 big clubs (Inter, Roma, Juventus and Milan) failed. This season Genoa had to play the first 2 homematches against 2 teams of the big 4: Milan and Roma. A very difficult opening of the season also because Genoa has a lot of new players that have to learn the typical Dutch way of football of Mr. Gasperini, but we also have Diego Alberto Milito back in the team …. As published on our website Tuesday Mr. Gasperini also selected the not completely recuperated Andrea Gasbarroni, the motor of Genoa against Milan. Everyone including coach Spaletti of Roma was surprised that Gasbarroni not only was inbetween the selection of 18 players, but also started in the line-up. Within 3 minutes the very fast and technical player sent a beautiful cross towards Giuseppe Sculli who surprised experienced defender Riise and goalkeeper Doni and scored the first goal. Of course Roma was awake after the goal and they honestly were the rest of the first half the best team in the field. In the 28th minute Daniele de Rossi scored the deserved equalizer by heading in a very dubious free-kick. Till half time Genoa saved the 1-1. In the second half Genoa played a lot more pressure and did not longer walk back towards the own penalty-area if Roma attacked and so a very nice match on a high level with 2 equal teams was created. After 55 minutes Andrea Gasbarroni was substituted by Raffaele Palladino who showed why he is one of the biggest talents of Italy. In the 61st minute Milito scored the leading goal: 2-1 when he reacted perfectly on a header of Juric. As a real goalscorer Milito was at the right moment at the right place and he scored this difficult opportunity easily. Only 5 minutes later everyone thought that Panucci (again an ex-player of Genoa) scored the 2-2 equalizer but the goal was irregular annulated by the linesman because of off-side. Roma was frustated which was the sign to Palladino to dribble around Daniele de Rossi who kicked him and got his 2nd yellow, so red card. The match still was not played, but in the 87th minute a perfect cross of Palladino was scored by the Prince of Baires (Argentina): Diego Milito, again at the right place at the right moment: 3-1. The match now was over and Genoa booked the 2nd victory against a team of the big 4 and Milito is the topscorer of Serie A: 4 goals in only 3 matches. Only 3 days after the match aginst Palermo a big opportunity to Genoa to forget the defeat in Sicily. Last year Genoa was both times very unlucky against Roma. In Luigi Ferraris we lost by a goal of ex-Genoano Panucci in the 90th minute (0-1), while in Stadio Olimpico Genoa came back after 2-0 in the first half till 2-2 (Rossi and Leon). Just before the end referee Banti helped the topteam of Rome with a very cheap penalty that was scored by Daniele de Rossi (3-2). Again Genoa lost at Sicily and again the deciding goal was made by an ex-player, this time Cesare Bovo who returned to Palermo this summer after he was hired to Genoa last season. To be honoust: Palermo deserved the victory, but with a ball on the crossbar of Milito (who also scored the goal of Genoa in the 89th minute) and a failed big opportunity of Olivera in extra-time we could draw. As expected Mr. Gasperini started with Raffaele Palladino in the line-up, but he did not play as good as Gasbarroni last week. 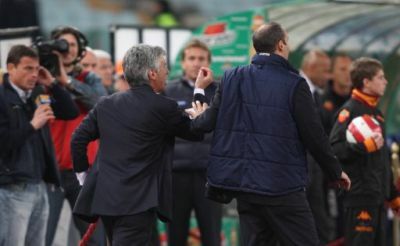 But Raffaele surely was not the only one who could not repeat the level of the match against Milan. While Palermo was the best team in the field it was Diego Milito who hit the crossbar with a fantastic shot in the 33rd minute. Six minutes later Cavani scored the opening-goal: 1-0. In the 59th minute ex-player Cesare Bovo doubled the score with a great shot of 30 meters. Just before the end of the regular playtime Milito scored the 1-2 after a cross of Modesto. While Genoa did not really deserve it, in the extra-time Ruben Olivera missed a great chance to score the equalizer. The man of the match last Sunday aginst Milan, Andrea Gasbarroni, is not healthy enough to play 3 matches in the next 7 days (tomorrow Palermo-Genoa, Wednesday Genoa-Roma and next Saturday Fiorentina-Genoa), so probably tomorrow Raffaele Palladino makes his debut in the line-up. The 24 years old striker already played some minutes against Catania and Milan but both matches Gasbarroni started in the line-up. The rest of the team, including Juric, is in good condition. 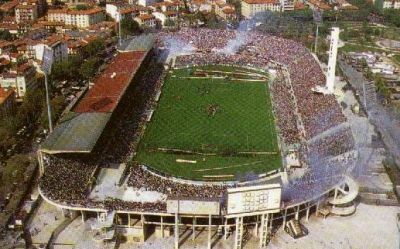 Yesterday Genoa sold seasonticket number 22.500, so the all time record of 23.125 in the Uefa-Cup season 1991-1992 is nearby. 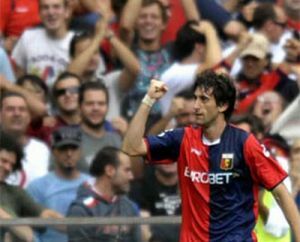 Since the arrival of Diego Milito 19 days ago Genoa sold over 3.000 seasontickets which means over 150 every day. Today Genoa presented the last new arrivals: midfielders Bosko Jankovic of Palermo and Thiago Motta of Atletico Madrid. Jankovic was already bought at the 1st September, the last day of the transfer-season. Brazilian midfield-player Thiago Motta ended his contract this summer with Atletico Madrid and signed last Sunday just before Genoa-Milan his 4 years contract. 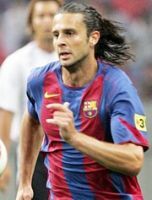 The 26 years old Motta played 5 years and 38 Champions league matches with F.C. Barcelona. Because of a heavy knee-injury he left Barcelona last year to Atletico Madrid, but in the capital of Spain he played because of his injury only 8 matches. A detailed medical test in Milano told Genoa that Motta is completely healthy now, so within a month he must be ready to play his first match in our red and blue shirt.